Princess Margaret, Countess of Snowdon, CI, GCVO, GCStJ (Margaret Rose; 21 August 1930 – 9 February 2002) was the younger daughter of King George VI and Queen Elizabeth and the only sibling of Queen Elizabeth II. Margaret spent much of her childhood with her parents and sister. Her life changed dramatically in 1936, when her paternal uncle, King Edward VIII, abdicated to marry a divorcée, Wallis Simpson. Margaret's father became king, and her sister became heir presumptive, with Margaret second in line to the throne. During the Second World War, the two sisters stayed at Windsor Castle, despite suggestions to evacuate them to Canada. During the war years, Margaret was considered too young to perform any official duties and instead continued her education. "Princess Margaret" redirects here. For other people of the same name, see Princess Margaret (disambiguation). For the title, see Earl of Snowdon. Margaret spent much of her childhood with her parents and sister. Her life changed dramatically in 1936, when her paternal uncle, King Edward VIII, abdicated to marry a divorcée, Wallis Simpson. Margaret's father became king, and her sister became heir presumptive, with Margaret second in line to the throne. During the Second World War, the two sisters stayed at Windsor Castle, despite suggestions to evacuate them to Canada. During the war years, Margaret was considered too young to perform any official duties and instead continued her education. After the war, Margaret fell in love with Group Captain Peter Townsend. In 1952, Margaret's father died, her sister became queen, and Townsend divorced his first wife. Early the following year, he proposed to Margaret. Many in the government believed he would be an unsuitable husband for the Queen's 22-year-old sister, and the Church of England refused to countenance marriage to a divorced man. Margaret eventually abandoned her plans with him, and in 1960 she married the photographer Antony Armstrong-Jones, who was created Earl of Snowdon by the Queen. The couple had two children: David and Sarah. Margaret was often viewed as a controversial member of the British royal family. Her divorce in 1978 earned her negative publicity, and she was romantically associated with several men. Her health gradually deteriorated in the final two decades of her life. A heavy smoker for most of her adult life, Margaret had a lung operation in 1985, a bout of pneumonia in 1993, and at least three strokes between 1998 and 2001. She died at King Edward VII's Hospital on 9 February 2002. Margaret was born on 21 August 1930 at Glamis Castle in Scotland, her mother's ancestral home, and was affectionately known as Margot within the royal family. She was delivered by Sir Henry Simson, the royal obstetrician. The Home Secretary, J. R. Clynes, was present to verify the birth. The registration of her birth was delayed for several days to avoid her being numbered 13 in the parish register. At the time of her birth, she was fourth in the line of succession to the British throne. Her father was the Duke of York (later King George VI), the second son of King George V and Queen Mary. Her mother was the Duchess of York (later Queen Elizabeth The Queen Mother), the youngest daughter of the 14th Earl and the Countess of Strathmore and Kinghorne. The Duchess of York originally wanted to name her second daughter Ann Margaret, as she explained to Queen Mary in a letter: "I am very anxious to call her Ann Margaret, as I think Ann of York sounds pretty, & Elizabeth and Ann go so well together." King George V disliked the name Ann but approved of the alternative "Margaret Rose". Margaret was baptised in the private chapel of Buckingham Palace on 30 October 1930 by Cosmo Lang, the Archbishop of Canterbury. Margaret's early life was spent primarily at the Yorks' residences at 145 Piccadilly (their town house in London) and Royal Lodge in Windsor. 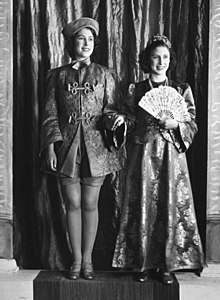 The Yorks were perceived by the public as an ideal family: father, mother and children, but unfounded rumours that Margaret was deaf and mute were not completely dispelled until Margaret's first main public appearance at her uncle Prince George's wedding in 1934. She was educated alongside her sister, Princess Elizabeth, by their Scottish governess Marion Crawford. Margaret's education was mainly supervised by her mother, who in the words of Randolph Churchill "never aimed at bringing her daughters up to be more than nicely behaved young ladies". When Queen Mary insisted upon the importance of education, the Duchess of York commented, "I don't know what she meant. After all I and my sisters only had governesses and we all married well—one of us very well". Margaret was resentful about her limited education, especially in later years, and aimed criticism at her mother. However, Margaret's mother told a friend that she "regretted" that her daughters did not go to school like other children, and the employment of a governess rather than sending the girls to school may have been done only at the insistence of King George V.
Margaret's grandfather, George V, died when she was five, and her uncle acceded as King Edward VIII. Less than a year later, on 11 December 1936, Edward abdicated to marry Wallis Simpson, a twice-divorced American, whom neither the Church of England nor the Dominion governments would accept as queen. The Church would not recognise the marriage of a divorced woman with a living ex-husband as valid. Edward's abdication left a reluctant Duke of York in his place as King George VI, and Margaret unexpectedly became second in line to the throne, with the title The Princess Margaret to indicate her status as a child of the sovereign. The family moved into Buckingham Palace; Margaret's room overlooked The Mall. Margaret was a Brownie in the 1st Buckingham Palace Brownie Pack, formed in 1937. She was also a Girl Guide and later a Sea Ranger. She served as President of Girlguiding UK from 1965 until her death in 2002. At the outbreak of World War II, Margaret and her sister were at Birkhall, on the Balmoral Castle estate, where they stayed until Christmas 1939, enduring nights so cold that drinking water in carafes by their bedside froze. They spent Christmas at Sandringham House before moving to Windsor Castle, just outside London, for much of the remainder of the war. Viscount Hailsham wrote to Prime Minister Winston Churchill to advise the evacuation of the princesses to the greater safety of Canada, to which their mother famously replied, "The children won't go without me. I won't leave without the King. And the King will never leave." Unlike other members of the royal family, Margaret was not expected to undertake any public or official duties during the war. She developed her skills at singing and playing the piano. Her contemporaries thought she was spoiled by her parents, especially her father, who allowed her to take liberties not usually permissible, such as being allowed to stay up to dinner at the age of 13. Crawford despaired at the attention Margaret was getting, writing to friends: "Could you this year only ask Princess Elizabeth to your party? ... Princess Margaret does draw all the attention and Princess Elizabeth lets her do that." Elizabeth, however, did not mind this, and commented, "Oh, it's so much easier when Margaret's there—everybody laughs at what Margaret says". King George described Elizabeth as his pride and Margaret as his joy. 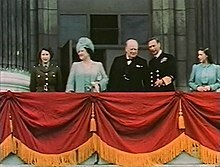 At the end of the war in 1945, Margaret appeared on the balcony at Buckingham Palace with her family and Prime Minister Winston Churchill. Afterwards, both Elizabeth and Margaret joined the crowds outside the palace, incognito, chanting, "We want the King, we want the Queen!" On 15 April 1946, Margaret was confirmed into the Church of England. On 1 February 1947, she, Elizabeth and their parents embarked on a state tour of Southern Africa. The three-month-long visit was Margaret's first visit abroad, and she later claimed that she remembered "every minute of it". Margaret was chaperoned by Peter Townsend, the King's equerry. Later that year, Margaret was a bridesmaid at Elizabeth's wedding. In the next three years Elizabeth had two children, Charles and Anne, whose births moved Margaret further down the line of succession. In 1950, the former royal governess, Marion Crawford, published an unauthorised biography of Elizabeth's and Margaret's childhood years, titled The Little Princesses, in which she described Margaret's "light-hearted fun and frolics" and her "amusing and outrageous ... antics". As a beautiful young woman, with an 18-inch waist and "vivid blue eyes", Margaret enjoyed socialising with high society and the young, aristocratic set, including Sharman Douglas, the daughter of the American ambassador, Lewis Williams Douglas. A celebrated beauty known for her glamour and fashion sense, Margaret was often featured in the press at balls, parties, and nightclubs. The number of her official engagements increased (they included a tour of Italy, Switzerland, and France), and she joined a growing number of charitable organisations as president or patron. Her 21st birthday party was held at Balmoral in August 1951. The following month her father underwent surgery for lung cancer, and Margaret was appointed one of the Counsellors of State who undertook the King's official duties while he was incapacitated. Her father died five months later, in February 1952, and her sister became queen. Margaret was grief-stricken by her father's death and was prescribed sedatives to help her sleep. Of her father she wrote, "He was such a wonderful person, the very heart and centre of our happy family." She was consoled by her deeply held Christian beliefs. With her widowed mother, Margaret moved out of Buckingham Palace and into Clarence House, while her sister and her family moved out of Clarence House and into Buckingham Palace. Peter Townsend was appointed Comptroller of her mother's restructured household. By 1953, he was divorced from his first wife and proposed marriage to Margaret. He was 16 years her senior and had two children from his previous marriage. Margaret accepted and informed her sister, the Queen, of her desire to marry Townsend. 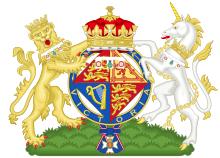 The Queen's consent was required by the Royal Marriages Act 1772. As in 1936, the Church of England refused to countenance the remarriage of the divorced. Queen Mary had recently died, and Elizabeth was about to be crowned. After her coronation, she planned to tour the Commonwealth for six months. The Queen told Margaret, "Under the circumstances, it isn't unreasonable for me to ask you to wait a year." The Queen was counselled by her private secretary, Sir Alan Lascelles, to post Townsend abroad, but she refused and instead transferred him from the Queen Mother's household to her own. The British Cabinet refused to approve the marriage, and newspapers reported that the marriage was "unthinkable" and "would fly in the face of Royal and Christian tradition". Churchill informed the Queen that the Dominion prime ministers were unanimously against the marriage and that Parliament would not approve a marriage that would be unrecognised by the Church of England unless Margaret renounced her rights to the throne. Churchill arranged for Townsend to be posted to Brussels. Polls run by popular newspapers appeared to show that the public supported Margaret's personal choice, regardless of Church teaching or the government's opinion. For two years, press speculation continued. Margaret was told by clerics that she would be unable to receive communion if she married a divorced man. I would like it to be known that I have decided not to marry Group Captain Peter Townsend. I have been aware that, subject to my renouncing my rights of succession, it might have been possible for me to contract a civil marriage. But mindful of the Church's teachings that Christian marriage is indissoluble, and conscious of my duty to the Commonwealth, I have resolved to put these considerations before others. I have reached this decision entirely alone, and in doing so I have been strengthened by the unfailing support and devotion of Group Captain Townsend. Randolph Churchill was concerned about rumours involving Archbishop Fisher with Princess Margaret's plans with Townsend. In his view, rumours "that Fisher had intervened to prevent the Princess from marrying Townsend has done incalculable harm to the Church of England". There was subsequent criticism in the UK about the Church's inflexibility as it related to divorce. Other rumoured suitors included the Hon. Dominic Elliot, Billy Wallace, Colin Tennant, and future Canadian Prime Minister John Turner. Princess Margaret first met the photographer Antony Armstrong-Jones at a supper party in 1958. She married Armstrong-Jones at Westminster Abbey on 6 May 1960. She reportedly accepted his proposal a day after learning from Peter Townsend that he intended to marry a young Belgian woman, Marie-Luce Jamagne, who was half his age and bore a striking resemblance to Princess Margaret. Margaret's announcement of her engagement, on 26 February 1960, took the press by surprise; she had taken care to conceal the romance from reporters. They had become engaged in October 1959. Armstrong-Jones proposed to Margaret with a ruby engagement ring surrounded by diamonds in the shape of a rosebud. The ceremony was the first royal wedding to be broadcast on television, and it attracted viewing figures of 300 million worldwide. 2,000 guests were invited for the wedding ceremony. Queen Ingrid of Denmark, and the King and Queen of Sweden were among the foreign royalty to attend the wedding. Margaret's wedding dress was designed by Norman Hartnell and worn with the Poltimore tiara. She had eight young bridesmaids, led by her niece, Princess Anne. The other bridesmaids were her goddaughter, Marilyn Wills, daughter of her aunt Jean Elphinstone and Major John Lycett Wills; Annabel Rhodes, daughter of her cousin Margaret Elphinstone and Denys Rhodes; Lady Virginia Fitzroy, daughter of Hugh Fitzroy, Earl of Euston; Sarah Lowther, daughter of Sir John Lowther; Catherine Vesey, daughter of Viscount de Vesci; Lady Rose Nevill, daughter of the Marquess of Abergavenny; and Lady Angela Nevill, daughter of Lord Rupert Nevill. She made her way with the Duke of Edinburgh from Clarence House in the Glass Coach, arriving at the church at 11:30. The Duke escorted the bride, and the best man was Dr Roger Gilliatt. The Archbishop of Canterbury Geoffrey Fisher conducted the marriage service. Following the ceremony, the couple made the traditional appearance on the balcony of Buckingham Palace. The honeymoon was a six-week Caribbean cruise aboard the royal yacht Britannia. As a wedding present, Colin Tennant gave her a plot of land on his private Caribbean island, Mustique. The newlyweds moved into rooms in Kensington Palace. In 1961, Margaret's husband was created Earl of Snowdon. The couple had two children (both born by Caesarean section at Margaret's request): David, Viscount Linley, born 3 November 1961, and Lady Sarah, born 1 May 1964. The marriage widened Margaret's social circle beyond the Court and aristocracy to include show business celebrities and bohemians. At the time, it was thought to reflect the breaking down of British class barriers. The Snowdons experimented with the styles and fashions of the 1960s. Among Margaret's first official engagements was launching the ocean liner Edinburgh Castle in Belfast in 1947. Subsequently, Margaret went on multiple tours of various places; in her first major tour she joined her parents and sister for a tour of South Africa in 1947. Her tour aboard Britannia to the British colonies in the Caribbean in 1955 created a sensation throughout the West Indies, and calypsos were dedicated to her. As colonies of the British Commonwealth of Nations sought nationhood, Princess Margaret represented the Crown at independence ceremonies in Jamaica in 1962 and Tuvalu and Dominica in 1978. Her visit to Tuvalu was cut short by an illness, which may have been viral pneumonia, and she was flown to Australia to recuperate. Other overseas tours included the United States in 1965, Japan in 1969 and 1979, the United States and Canada in 1974, Australia in 1975, the Philippines in 1980, Swaziland in 1981, and China in 1987. During an official visit to Copenhagen, Denmark, in 1964, she was allegedly bugged by the KGB. Her main interests were welfare charities, music and ballet. She was president of the National Society and of the Royal Scottish Society for the Prevention of Cruelty to Children and Invalid Children's Aid Nationwide (also called 'I CAN'). She was Grand President of the St John Ambulance Brigade and Colonel-in-Chief of Queen Alexandra's Royal Army Nursing Corps. She was also the president or patron of numerous organisations, such as the West Indies Olympic Association, the Girl Guides, Northern Ballet Theatre, Birmingham Royal Ballet, Scottish Ballet, Children 1st, Tenovus Cancer Care, the Royal College of Nursing, and the London Lighthouse (an AIDS charity that has since merged with the Terrence Higgins Trust). At some points Margaret was criticised for not being as active as other members of the royal family. Reportedly, Margaret had her first extramarital affair in 1966, with her daughter's godfather Anthony Barton, a Bordeaux wine producer. A year later she had a one-month liaison with Robin Douglas-Home, a nephew of former British Prime Minister Alec Douglas-Home. Margaret claimed that her relationship with Douglas-Home was platonic, but her letters to him (which were later sold) were intimate. Douglas-Home, who suffered from depression, committed suicide 18 months after the split with Margaret. Claims that she was romantically involved with musician Mick Jagger, actor Peter Sellers, and Australian cricketer Keith Miller are unproven. According to biographer Charlotte Breese, entertainer Leslie Hutchinson had a "brief liaison" with Margaret in 1955. A 2009 biography of actor David Niven included assertions, based on information from Niven's widow and a good friend of Niven's, that he had had an affair with the princess, who was 20 years his junior. In 1975, the Princess was listed among women with whom actor Warren Beatty had had romantic relationships. John Bindon, a Cockney actor who had spent time in prison, sold his story to the Daily Mirror, boasting of a close relationship with Margaret. By the early 1970s, the Snowdons had drifted apart. In September 1973, Colin Tennant (later Baron Glenconner) introduced Margaret to Roddy Llewellyn. Llewellyn was 17 years her junior. In 1974, she invited him as a guest to the holiday home she had built on Mustique. It was the first of several visits. Margaret described their relationship as "a loving friendship". Once, when Llewellyn left on an impulsive trip to Turkey, Margaret became emotionally distraught and took an overdose of sleeping tablets. "I was so exhausted because of everything", she later said, "that all I wanted to do was sleep." As she recovered, her ladies-in-waiting kept Lord Snowdon away from her, afraid that seeing him would distress her further. In February 1976, a picture of Margaret and Llewellyn in swimsuits on Mustique was published on the front page of the News of the World tabloid. The press portrayed Margaret as a predatory older woman and Llewellyn as her toyboy lover. On 19 March 1976, the Snowdons publicly acknowledged that their marriage had irretrievably broken down. Some politicians suggested removing Margaret from the civil list. Labour MPs denounced her as "a royal parasite" and a "floosie". In May 1978, she was taken ill, and diagnosed as suffering from gastroenteritis and alcoholic hepatitis. On 11 July 1978, the Snowdons' divorce was finalised. It was the first divorce of a senior member of the British royal family since Princess Victoria Melita of Edinburgh's in 1901. In December 1978, Snowdon married Lucy Lindsay-Hogg. In August 1979, Louis Mountbatten, 1st Earl Mountbatten of Burma, and members of his family were killed by a bomb planted by the Provisional Irish Republican Army. That October, while on a fundraising tour of the United States on behalf of the Royal Opera House, Margaret was seated at a dinner reception in Chicago with columnist Abra Anderson and mayor Jane Byrne. Margaret told them that the royal family had been moved by the many letters of condolence from Ireland. The following day, Anderson's rival Irv Kupcinet published a claim that Margaret had referred to the Irish as "pigs". Margaret, Anderson and Byrne all issued immediate denials, but the damage was already done. The rest of the tour drew demonstrations, and Margaret's security was doubled in the face of physical threats. In 1981, Llewellyn married Tatiana Soskin, whom he had known for 10 years. Margaret remained close friends with them both. In January 1981, Margaret was a guest on the BBC Radio 4 programme Desert Island Discs. The appearance is described by The Guardian: "She is fantastically posh, chooses Rule Britannia as one of her discs, and asks for Scotland the Brave played by the pipes and drums of 'my regiment', the Royal Highland Fusiliers." The Princess's later life was marred by illness and disability. She had smoked cigarettes since the age of 15, or earlier, and had continued to smoke heavily for many years. In January 1980, Margaret underwent a surgery "to remove a benign skin lesion". On 5 January 1985, she had part of her left lung removed; the operation drew parallels with that of her father over 30 years earlier. In 1991, she gave up smoking, though she continued to drink heavily. In January 1993, she was admitted to hospital for pneumonia. She experienced a mild stroke in 1998 at her holiday home in Mustique. Early the following year the Princess suffered severe scalds to her feet in a bathroom accident, which affected her mobility to the extent that she required support when walking and sometimes used a wheelchair. The Princess, who had become bedridden in late 2000, was unable to attend the church services on Christmas Day. She was hospitalised in January 2001 due to loss of appetite and swallowing problems. In January and March 2001, further strokes left her with partial vision and paralysis on the left side. Margaret's last public appearances were at the 101st birthday celebrations of her mother in August 2001 and the 100th birthday celebration of her aunt, Princess Alice, Duchess of Gloucester, that December. Princess Margaret died in the King Edward VII's Hospital, London, at 06:30 (GMT) on 9 February 2002 at the age of 71, after suffering another stroke that resulted in cardiac problems. The Prince of Wales paid tribute to his aunt in a television broadcast. Margaret's coffin, draped in her personal standard, was taken from Kensington Palace to St James's Palace before her funeral. The funeral was held on 15 February 2002, the 50th anniversary of her father's funeral. In line with her wishes, the ceremony was a private service at St George's Chapel, Windsor Castle, for family and friends. Unlike most other members of the royal family, Princess Margaret was cremated, at Slough Crematorium. Her ashes were placed in the tomb of her parents, King George VI and Queen Elizabeth The Queen Mother (who died seven weeks after Margaret), in the King George VI Memorial Chapel in St George's Chapel two months later. A state memorial service was held at Westminster Abbey on 19 April 2002. Observers often characterised Margaret as a spoiled snob capable of cutting remarks and hauteur. Critics claimed that she even looked down on her own grandmother, Queen Mary, because Mary was born a princess with the lower "Serene Highness" style, whereas Margaret was a "Royal Highness" by birth. Their letters, however, provide no indication of friction between them. Margaret could also be charming and informal. People who came into contact with her could be perplexed by her swings between frivolity and formality. Former governess Marion Crawford wrote in her memoir: "Impulsive and bright remarks she made became headlines and, taken out of their context, began to produce in the public eye an oddly distorted personality that bore little resemblance to the Margaret we knew." Margaret's acquaintance Gore Vidal, the noted American writer, wrote: "She was far too intelligent for her station in life." He recalled a conversation with Margaret in which, discussing her public notoriety, she said: "It was inevitable, when there are two sisters and one is the Queen, who must be the source of honour and all that is good, while the other must be the focus of the most creative malice, the evil sister." Following Margaret's death, her lady-in-waiting, Lady Glenconner, said that "[Margaret] was devoted to the Queen and tremendously supportive of her." Her cousin, Lady Elizabeth Shakerley, described Margaret as "somebody who had a wonderful capacity for giving a lot of people pleasure and she was making a very, very, very good and loyal friend." Another cousin, Lord Lichfield, said that "[Margaret] was pretty sad towards the end of her life because it was a life unfulfilled." In her lifetime, Margaret's fortune was estimated to be around £20 million, with most of it being inherited from her father. She also inherited pieces of art and antiques from her grandmother Queen Mary, and Dame Margaret Greville left her £20,000 in 1943. In 1999, her son, Lord Linley, sold his mother's Caribbean residence Les Jolies Eaux for a reported £2.4 million. At the time of her death Margaret received £219,000 from the Civil List. Following her death, she left a £7.6 million estate to her two children, which was cut down to £4.5 million after inheritance tax. In June 2006, much of Margaret's estate was auctioned by Christie's to meet the tax and, in her son's words, "normal family requirements such as educating her grandchildren", though some of the items were sold in aid of charities such as the Stroke Association. Reportedly, the Queen had made it clear that the proceeds from any item that was given to her sister in an official capacity must be donated to charities. A world record price of £1.24 million was set by a Fabergé clock. The Poltimore tiara, which she wore for her wedding in 1960, sold for £926,400. The sale of her effects totalled £13,658,000. In April 2007, an exhibition titled Princess Line – The Fashion Legacy of Princess Margaret opened at Kensington Palace, showcasing contemporary fashion from British designers such as Vivienne Westwood inspired by Princess Margaret's legacy of style. Christopher Bailey's Spring 2006 collection for Burberry was inspired by Margaret's look from the 1960s. Princess Margaret's private life was for many years the subject of intense speculation by media and royal-watchers. Her house on Mustique, designed by her husband's uncle Oliver Messel, a stage designer, was her favourite holiday destination. Allegations of wild parties and drug taking were made in a documentary broadcast after the Princess's death. Biographer Warwick suggests that Margaret's most enduring legacy is an accidental one. Perhaps unwittingly, Margaret paved the way for public acceptance of royal divorce. Her life, if not her actions, made the decisions and choices of her sister's children, three of whom divorced, easier than they otherwise would have been. The Princess's personalised coat of arms were those of the Royal coat of arms of the United Kingdom with a label for difference. The Royal Victorian Order ribbon. 1 2 "A break in Royal tradition". BBC. 15 February 2002. Retrieved 19 March 2018. ↑ As a titled royal, Margaret held no surname, but when one was used, it was Windsor. ↑ In 2002, the Church of England changed its policy on marriages of divorced persons. Under certain circumstances, it now permits a person with a former spouse still living to remarry in church. ↑ "No. 33636". The London Gazette. 22 August 1930. p. 5225. ↑ Davies, Caroline (11 February 2002). "A tale of two sisters' enduring affection". The Daily Telegraph. ↑ "Henry John Forbes Simson 1872‐1932". BJOG: An International Journal of Obstetrics and Gynaecology. December 1932. Retrieved 12 June 2018. ↑ "Ma'am darling:The princess driven by loyalty and duty". The Independent. 25 February 1998. Retrieved 10 April 2013. ↑ "Yvonne's Royalty Home Page: Royal Christenings". Yvonne Demoskoff. ↑ Her godparents were: the Prince of Wales (her paternal uncle, for whom his brother Prince George stood proxy); Princess Ingrid of Sweden (her paternal cousin, for whom another cousin Lady Patricia Ramsay stood proxy); Princess Victoria (her paternal great-aunt); Lady Rose Leveson-Gower (her maternal aunt); and the Hon David Bowes-Lyon (her maternal uncle). ↑ Paul Reynolds (19 November 2016). "Did the Queen stop Princess Margaret marrying Peter Townsend?". bbc.co.uk. BBC. Retrieved 19 November 2016. ↑ Ann Sumner Holmes (13 October 2016). The Church of England and Divorce in the Twentieth Century: Legalism and Grace. Routledge. p. 78-79. ISBN 9781848936171. Retrieved 3 January 2019. ↑ "Princess Meg To Marry Commoner Named Jones". Victoria Advocate. Victoria, Texas. Associated Press. 27 February 1960. p. 1. Retrieved 10 May 2013. ↑ "Princess Margaret and future PM John Turner may have 'nearly married', letters reveal". CBC News. 21 February 2015. 1 2 3 4 5 6 "1960: Margaret weds Armstrong-Jones". BBC. Retrieved 14 May 2018. ↑ "Princess Margaret, daughter of George VI". Westminster Abbey. Retrieved 14 May 2018. ↑ Heald, p. 112: "looked strikingly like Princess Margaret"; Warwick, p. 223: "more than a passing resemblance to the Princess"
↑ "Princess Margaret's wedding". BBC. Retrieved 14 May 2018. ↑ "A Close Look at the British Royal Family's Engagement Rings (slide 4)". Vogue. Retrieved 15 May 2018. ↑ Bonner, Mehera (25 October 2017). "The Most Gorgeous Royal Engagement Rings: Your Official Guide to Who Owns What". Marie Claire UK. Retrieved 15 May 2018. ↑ Documentary Happy and Glorious – Royal Weddings On Film. ↑ "Margaret names her bridesmaids". Royal Musings. ↑ "Princess Margaret". The Guardian. Retrieved 27 July 2014. ↑ "Princess Margaret and Northern Ireland". BBC. 9 February 2002. Retrieved 19 March 2018. ↑ "Princess Margaret 'spied on by KGB'". The Sun. 1 2 3 4 5 "The charitable princess". BBC. 9 February 2002. Retrieved 19 March 2018. ↑ "Northern ballet theatre". Retrieved 10 April 2013. ↑ "Tributes pour in from across England". BBC. 9 February 2002. Retrieved 27 May 2018. 1 2 3 "Scots sorrow at death of princess". BBC. 9 February 2002. Retrieved 27 May 2018. 1 2 "Welsh tributes flow for princess". BBC. 9 February 2002. Retrieved 27 May 2018. ↑ Breese, Charlotte (2012). "Chapter Twelve: The Sweet Smell 1956-1959". Hutch. London: Bloomsbury. ISBN 978-1-4088-3113-7. ↑ Munn, Michael (24 May 2009). "Oh God, I wanted her to die", The Sunday Times, Retrieved 29 May 2009. ↑ "1976: Princess Margaret and Lord Snowdon to split". BBC. Retrieved 14 May 2018. ↑ Pimlott, Ben (1996). "The Princess and the Press: The Fate of Margaret". PBS. Retrieved 16 March 2018. ↑ Apple Jr., R.W. (1981). 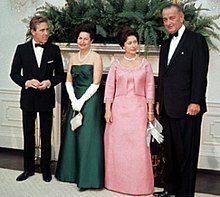 "British, Uneasy Over Irish, Cancel Visit To U.S. By Princess Margaret". The New York Times. Retrieved 16 March 2018. ↑ "BBC Radio 4 - Desert Island Discs, HRH Princess Margaret". BBC. 23 January 1981. Retrieved 16 March 2018. ↑ Moss, Stephen (6 January 2017). "Desert Island Discs: 75 defining moments from 75 years of castaways". The Guardian. Retrieved 16 March 2018. 1 2 "Princess's history of ill health". BBC. 9 February 2002. Retrieved 18 March 2018. ↑ "A lifetime dogged by ill-health". The Guardian. 9 February 2002. Retrieved 18 March 2018. ↑ "Margaret 'getting better' says Queen". BBC. 7 January 2001. Retrieved 16 March 2018. ↑ "Princess Margaret: The medical care". BBC. 11 January 2001. Retrieved 16 March 2018. ↑ "Charles visits Princess Margaret". BBC. 15 January 2001. Retrieved 16 March 2018. ↑ "Heir to the throne on death of his aunt". AP Archive. YouTube. 24 July 2015. Retrieved 27 May 2018. ↑ "Charles: My darling aunt". BBC. 9 February 2002. Retrieved 27 May 2018. ↑ "Princess to be cremated". BBC. 12 February 2002. Retrieved 19 March 2018. ↑ Davies, Caroline (16 February 2002). "Bell tolls for Margaret's final journey". The Daily Telegraph. Retrieved 19 March 2018. 1 2 Vidal, Gore (2006). Point to Point Navigation. London: Little, Brown. ISBN 0-316-02727-8. 1 2 "Princess Margaret: Tributes at a glance". BBC. 9 February 2002. Retrieved 28 May 2018. ↑ "Margaret's cousin attacks 'cruel' media". BBC. 10 February 2002. Retrieved 28 May 2018. 1 2 3 4 5 Pook, Sally (26 June 2002). "Margaret leaves £7.6m fortune to her children". The Daily Telegraph. Retrieved 2 June 2018. ↑ Nikkhah, Roya (14 January 2007). "Viscount Linley defends royal auction". The Daily Telegraph. Retrieved 2 June 2018. ↑ Alderson, Andrew (11 June 2016). "Queen urges Margaret's heirs to avoid another royal gift scandal". The Daily Telegraph. Retrieved 2 June 2018. ↑ "Princess's gems, tiara for auction". CNN. 9 June 2006. Retrieved 2 June 2018. ↑ "Royal auction raises over £13.5m". BBC. 15 June 2006. Retrieved 2 June 2018. 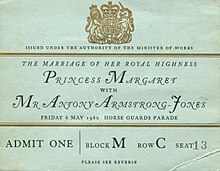 ↑ Princess Margaret at no time assumed the title "Princess Margaret, Mrs Antony Armstrong-Jones" (see e.g. issues of the London Gazette 1 November 1960, 25 November 1960, 24 February 1961, 28 February 1961, 3 March 1961 and 24 March 1961). ↑ "No. 37976". The London Gazette (Supplement). 6 June 1947. p. 2569. ↑ "No. 38339". The London Gazette. 29 June 1948. p. 3787. ↑ "No. 39863". The London Gazette (Supplement). 26 May 1953. p. 2940. ↑ "No. 40818". The London Gazette. 29 June 1956. p. 3803. ↑ "No. 52253". The London Gazette. 24 August 1990. p. 13769. ↑ "No. 39865". The London Gazette (Supplement). 26 May 1953. p. 2997. ↑ "No. 49902". The London Gazette. 19 October 1984. p. 14141. ↑ "No. 41535". The London Gazette (Supplement). 28 October 1958. p. 6639. ↑ "No. 54745". The London Gazette (Supplement). 21 April 1997. p. 4766. ↑ "No. 40286". The London Gazette (Supplement). 24 September 1954. p. 5499. ↑ "No. 41801". The London Gazette (Supplement). 25 August 1959. p. 5421. ↑ "No. 47234". The London Gazette (Supplement). 10 June 1977. p. 7079. 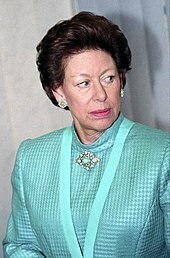 Wikimedia Commons has media related to Princess Margaret, Countess of Snowdon.